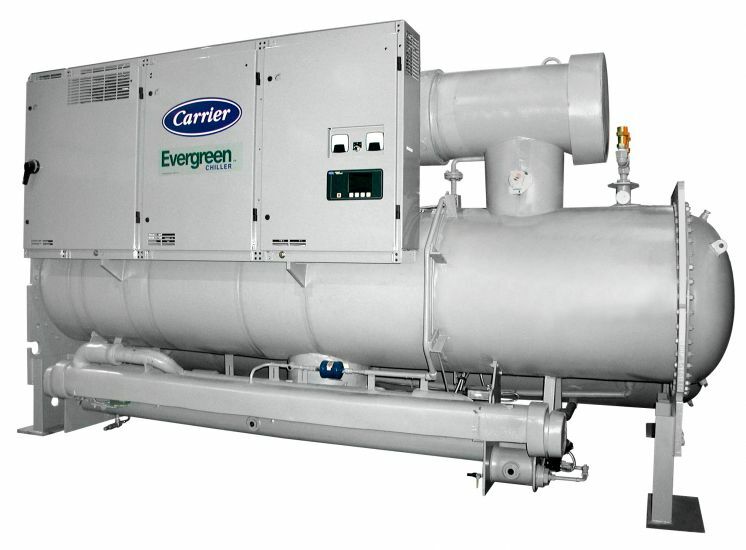 Carrier’s Evergreen® 23XRV chiller is the world’s first integrated variable speed, water-cooled, screw chiller. It incorporates significant breakthroughs in water-cooled chiller technology to provide excellent reliability and achieve superior efficiencies at true operating conditions without compromising the environment. l Variable speed, positive displacement screw compressor. l Air Conditioning and Refrigerant Institute (ARI) certified efficiencies to 0.33 kW/ton (ARI IPLV). l IEEE-519 compliance for harmonic distortion. l An ideal solution for constant and variable flow pumping systems. Quality design and construction make the Evergreen 23XRV chillers the best choice for modern, efficient chilled water plants. The 23XRV chiller uses proven technology from Carrier’s existing line of Evergreen chillers along with innovations that increase reliability. The 23XRV compressors are designed for extremely high reliability. The advanced tri-rotor compressor features a balanced rotor geometry and shorter screw lengths, resulting in vastly reduced compressor bearing loads and a minimum L10 compressor bearing life in excess of 500,000 hours when operated at ARI conditions. Variable speed capacity control eliminates slide valves, their associated losses, and their potential failure modes. Component count (both rotating and total) has been minimized assuring maximum reliability under a wide range of operating conditions. Per ARI 550/590, chillers operate at design conditions less than one percent of the time. As a result, superior part load efficiency is required for today’s chilled water applications. The Evergreen® 23XRV screw chiller maximizes chiller efficiency by optimizing compressor operation. Electric power consumption drops dramatically when the motor speed slows. The 23XRV screw chiller delivers industry-leading integrated part-load values (IPLV) in an extremely broad range of applications and climates. Carrier has long been committed to the environment and its sustainability. The Evergreen 23XRV screw chillers provide our customers with a high efficiency, chlorine-free, long-term solution unaffected by refrigerant phase outs. Carrier’s decision to utilize non-ozone depleting HFC-134a refrigerant provides our customers with a safe and environmentally sound product without compromising efficiency. Refrigeration and Air Conditioning Engineers), meaning that it is the safest refrigerant available. Positive displacement compression ensures stable operation under all load conditions without the possibility of compressor surge. All Evergreen 23XRV chillers regulate oil temperature, viscosity and pressure. A patented process assures high quality oil is delivered to the compressor bearings by a positive displacement pump. Bearing lubrication is assured, allowing continuous operation with cold condenser water at all loads. Screw chillers no longer need to rely on differential system pressure to effectively lubricate the compressor. Should the input power to the chiller be lost, the system design assures proper lubrication of the bearings during coast down. The Evergreen 23XRV chiller’s positive pressure design reduces the chiller size by up to 35% compared to negative-pressure designs. Extremely high compression efficiencies allow for compact, high-efficiency chillers that require less mechanical room floor space. Constant or variable evaporator flow — The 23XRV chiller combines the advantages of positive displacement compression with variable speed capacity control. This process provides a chiller that reacts substantially better than chillers equipped with inlet guide vanes or slide valves. This allows for easier transition when bringing additional chillers on line in multiple chiller plants and eliminates any possibility of surge, regardless of the changes in the system. The Evergreen 23XRV chiller will generate less than 5% total harmonic distortion at the input to the VFD (variable frequency drive) without the use of any external filters or line reactors. This assures the VFD alone cannot exceed the IEEE-519 standard for distortion at the point of common coupling. Ultra-low harmonics can eliminate the need for complicated harmonic system studies. The inrush current is limited to the chiller full load amps (rated load amperes). No other starting means can equal this level of starting current. The combination of low current and ultra low harmonics can reduce backup generator size requirements. The Evergreen 23XRV chiller can operate at up to 0.99 displacement power factor, which helps building owners avoid power factor penalties and decreases electrical losses in cables and transformers. High power factor may also reduce KVA requirements, saving electrical system costs on new projects or freeing up electrical resources on existing systems operating near their maximum capacity. Refrigerant cooling of the VFD minimizes VFD size and ensures proper cooling of the transistors for extended life. Using R-134a refrigerant instead of water also eliminates costly maintenance associated with the water cooling pump, heat exchanger and rubber tubing used with water-cooled VFDs. The Evergreen 23XRV chiller utilizes motors that are hermetically sealed from the machine room. Cooling is accomplished by spraying liquid refrigerant on the motor windings. This highly efficient motor cooling method results in cooler running motors than could be realized with air-cooled designs of the same type.